*****WINNER SELECTED!!! Joanna from we heart art!! 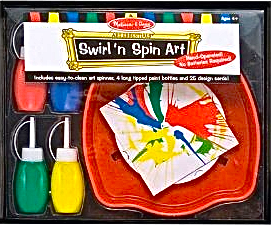 I am having my First giveaway for a Melissa and Doug Swirl 'n Spin Art Machine!!!! We LOVE Spin Art!!! We would like one of our wonderful readers to have an opportunity to win one of these great toys!! This great set has created wonderful Spin Art for us in our last post: Spin Art Easter Eggs and in our February post: Pop Artish Spin Art Valentines! Thanks to those who entered!!! Giveaway is open to all US residents. For your chance to win make a comment on this post about my blog or about a creative idea you have for spin art. Make a comment on one of my spin art posts above (click below the picture)!!! Blog about this giveaway on FB or Twitter! Winner will be chosen at random and will be contacted by e-mail. Giveaway ends Tuesday, April 19th 2011 @ 8:00 pm EST. I love anything from Melissa and Doug. How awesome! My preschoolers would LOVE to use this!! I love your spin art eggs! I especially love that you turned them into a garland! We'd love to add this to our studio, even though we use the salad spinner this would be perfect for adding color while already spinning! I'm a FB fan too!!! I would love to win this for my classroom! Thanks for the chance! I had just commented on ur spin art egg post with my queries and now i have chance to win this, yay!! Posted this on my FB wall. My son loves making cards for members of our family... anytime something good OR bad happens, he's all "Can we make a card for them?" I think he would love to show off some of this pretty spin-art in a card form of some sort! Would love to win this! I commented on the Easter Egg post! what a great giveaway! I would love to do this with my 3 girls, controlled mess, I love it! I subscribe with a reader too. I'm posting this on my FB page - and on my personal page :) Though I'm very hesitant to do this... I don't want more entries :) I wanna win it! My 5 year old loves projects, this spin art would be a blast. I followed you via Google now. And posted a comment on the Easter Egg Spin Art Post. My head is "spinning" with ideas on how to use this. I will have to put it on my wish list. I love your blog. This would be so much fun to do with my three year old. I made a comment on your Valentine heart spin art post. I love all the fun ideas that you share! Thanks for hosting this great giveaway!! I also left a comment on Easter egg. And I like you on FB as Kerri A! I'd love to win! Melissa and Doug art products are the best! We love all your great ideas! Especially all the toilet roll creations! You have such a fun blog! We would love to have this in our house! I posted a comment on your Valentine spin art, loved it! I've always wanted one of these to use as an activity at a birthday party. Great giveaway and I love the Easter eggs. Loved the Spin Art Easter Egg, awesome work! this would be perfect for our spring break! I recently found your blog and I love it. Your daughter is so lucky to do all those fun crafts every day. She looks very talented. Loved the spin art easter egg! I would love to try taping in a small balloon and see what happens! I LOVE your blog!!! It's such a fun place to help get creative! Thank you for everything! I wrote a comment about the heart spin art too! love it!! I just found your blog (via Makes and Takes) and I loved it! I found you via Make and Takes too! I once had a notion to try spin art with a salad spinner but couldn't think of how to add the paint while spinning it! Oh, well. I love your spin art eggs. Adorable! First time on your site! Love it!! I'm a new fan on facebook! This is great! I've been thinking about getting one of these for a long time! I am a new fan on facebook! Your creativity is great and i'm so glad you show us how to do the projects with photos because i myself am a visual learner~Thank you.